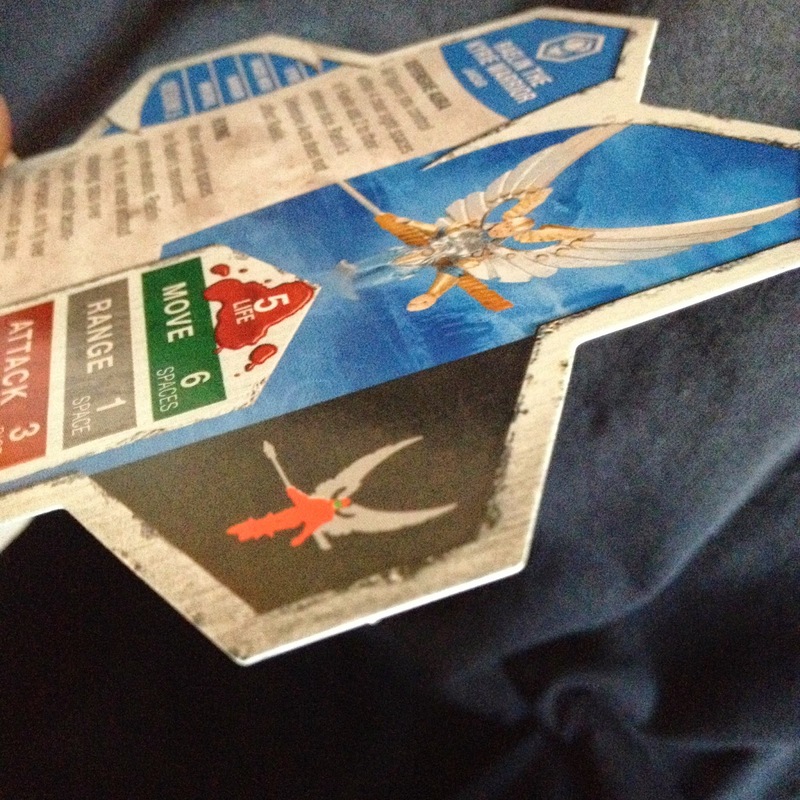 Nothing But Sixes: Reviewing Heroscape: Nothing But... Blue Shields and Red Skulls? Reviewing Heroscape: Nothing But... Blue Shields and Red Skulls? Heroscape is an out of print miniatures game produced by Milton Bradley. I recently acquired a copy of the original Rise of the Valkyrie starter set with the intention of immediately reselling it. After seeing that the majority of Heroscape's reviews were nothing less than fanatical, I decided I should at least play the game before selling it. I have a hard time trying to decide whether the contents of Rise of the Valkyrie are impressive or or disappointing. You get a lot in the box, including the miniatures and the terrain tiles, however miniatures are some of the worst I have seen included in a game. The sculpts are poorly detailed, with sub-par paint jobs (even for a pre-painted game), and the plastic is more rubbery than most gamers would be used to. The majority of board game figures have equal or better detail than these miniatures. The included terrain tiles were where I thought the starter set's value really came from. There's plenty of hexagonal terrain tiles in the box, with tons of options as to how you can put the board together. In fact, building the terrain was almost as much fun as playing the game. Another factor that some gamers may find off-putting is that the game looks and feels like a toy versus most contemporary wargames. The custom dice and markers are of a decent quality, while the cards feel too thin and fragile in relation to the other components. The alien Marro were some of my favourite figures included in the box. Heroscape's gameplay is extremely simplistic when compared to what most miniature wargamers will be used to. The rulebook is really more of a pamphlet. Early on I thought that this would be a limitation, however once I played my first game I realized it's one of the Heroscape's strengths. The rules are straightforward, while giving enough rules variety to create cinematic games. I found it easy to forget about the game rules and instead focus on the imaginary battle unfolding on the tabletop. While other more complex games can achieve this effect, they to bring the cinema to a halt when finer rules minutia force players to check charts or rules. The variety in the gameplay comes from the wide range of special rules used in the game. The majority of the special rules in the game are specific to one unit, and while some generic rules are used it's rare to see more than one unit on the table with a particular special rule. Additionally, special rules are printed in their entirety on the stat cards, so players won't have to reference any books. The background of Heroscape is the weakest element of the game. The battles take place in Valhalla (the realm from Norse mythology), where a civil war among the Valkyries has resulted in the greatest warriors throughout all of time and space being gathered to fight each other. The backstory seems more like a justification for the fact that Heroscape features everything from World War II paratroopers to cyborg war-machines from another planet. There isn't much development beyond that, just a list of the Valkyrie generals, which dictate the factions. I don't mind the underdeveloped setting largely because I don't like the setting all that much. It was a little too zany for my taste. I would have enjoyed more backstory on the heroes and units, specifically the original creations from the developers like the Marro aliens and Deathwalker 9000. Deathwalker 9000, while a neat model with a great name, suffered from a complete and total lack of backstory. Disappointing, as it's one of the coolest figures in the starter set. Heroscape is not without its flaws. Despite its limitations, the game is a quick, affordable, and immersive experience. If it sounds appealing to you, I would recommend picking up a copy of the starter set. I enjoyed playing it enough that I'm planning on holding on to my copy rather than selling it. That having been said, I'm not sure when it will see the table again, and I don't plan on making any additional Heroscape purchases. It's fun as a self-contained game but it won't a part of my primary gaming routine.